All three films in director Peter Jackson’s trilogy based on J.R.R. 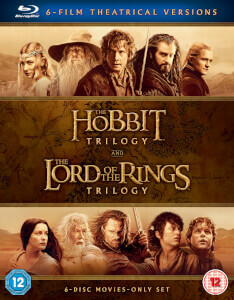 Tolkien’s enduring masterpiece in one complete collection. Follow Bilbo Baggins, who – along with the Wizard Gandalf and 13 Dwarves, led by Thorin Oakenshield – is swept into an epic and treacherous quest to reclaim the lost Dwarf Kingdom of Erebor. Bilbo and the Dwarves escape the giant Spiders and Wood-elves of Mirkwood before encountering the mysterious Bard, who smuggles them into Lake-town. Finally reaching the Lonely Mountain, they confront the Dragon Smaug. The Dwarves of Erebor have reclaimed their homeland, but face the consequences of unleashing Smaug. As five great armies go to war, Bilbo fights for his life, and the races of Dwarves, Elves and Men must unite or be destroyed.